Apple reported that its earnings rose 54% in its fourth quarter on the back of strong sales of the Apple iPhone 4 and Apple iPad 2. Still, the $7.05 a share earnings report came in below expectations sending the stock 5% lower after hours. Analysts expected profits of as much as $9.01 a share for the period. Gross margin was wider at 40.3% from 36.9%. Apple sold 17.1 million units of the Apple iPhone last quarter and 11.1 million Apple iPod copies. For the former, that was a 21% increase from the prior year and for the latter, sales nearly tripled year-over-year. Just last Friday, the company launched the Apple iPhone 4S and the latest iteration of Apple's touchscreen phone sold 4 million units over the opening 3 days. The latest iPhone won't have an impact on earnings until the first quarter 2012 report. It is a strong start to Apple's flagship product which nonetheless has some tough competition including the Samsung Galaxy S II and the just announced Motorola DROID RAZR. Tonight, another competitor will be launched when Google and Samsung introduce the Google Nexus Prime (also known as the Google Galaxy Nexus), the first phone to run on the latest Android build, Ice Cream Sandwich. CUPERTINO, California—October 18, 2011—Apple® today announced financial results for its fiscal 2011 fourth quarter ended September 24, 2011. The Company posted quarterly revenue of $28.27 billion and quarterly net profit of $6.62 billion, or $7.05 per diluted share. These results compare to revenue of $20.34 billion and net quarterly profit of $4.31 billion, or $4.64 per diluted share, in the year-ago quarter. Gross margin was 40.3 percent compared to 36.9 percent in the year-ago quarter. International sales accounted for 63 percent of the quarter’s revenue. This press release contains forward-looking statements including without limitation those about the Company’s estimated revenue and earnings per share. These statements involve risks and uncertainties, and actual results may differ. Risks and uncertainties include without limitation the effect of competitive and economic factors, and the Company’s reaction to those factors, on consumer and business buying decisions with respect to the Company’s products; continued competitive pressures in the marketplace; the ability of the Company to deliver to the marketplace and stimulate customer demand for new programs, products, and technological innovations on a timely basis; the effect that product introductions and transitions, changes in product pricing or mix, and/or increases in component costs could have on the Company’s gross margin; the inventory risk associated with the Company’s need to order or commit to order product components in advance of customer orders; the continued availability on acceptable terms, or at all, of certain components and services essential to the Company’s business currently obtained by the Company from sole or limited sources; the effect that the Company’s dependency on manufacturing and logistics services provided by third parties may have on the quality, quantity or cost of products manufactured or services rendered; risks associated with the Company’s international operations; the Company’s reliance on third-party intellectual property and digital content; the potential impact of a finding that the Company has infringed on the intellectual property rights of others; the Company’s dependency on the performance of distributors, carriers and other resellers of the Company’s products; the effect that product and service quality problems could have on the Company’s sales and operating profits; the continued service and availability of key executives and employees; war, terrorism, public health issues, natural disasters, and other circumstances that could disrupt supply, delivery, or demand of products; and unfavorable results of other legal proceedings. More information on potential factors that could affect the Company’s financial results is included from time to time in the “Risk Factors” and “Management’s Discussion and Analysis of Financial Condition and Results of Operations” sections of the Company’s public reports filed with the SEC, including the Company’s Form 10-K for the fiscal year ended September 25, 2010, its Forms 10-Q for the quarters ended December 25, 2010; March 26, 2011; and June 25, 2011; and its Form 10-K for the fiscal year ended September 24, 2011 to be filed with the SEC. The Company assumes no obligation to update any forward-looking statements or information, which speak as of their respective dates. I'm not seeing any of these reports that you're claiming. Can you show even 1 article with these reports? Apple compliants forums no less,it'll be phonearena news posts or similar soon.Last years early complaints was for localised yellow spots,these complaints are yellow toning and tinting and washing out colurs throughout which is not glue,but faulty screen toning or software. the battery gate is starting to hit the new big time as phonearena have picked up on! how is it going sir?!! sooo gallito how are you liking your iphone 4s ?? Well, FINALLY Apple's iPhone 4 sales dropped (by about 3 million) from last quarter. About time. They'll probably jump again when the January report comes out. They just had a launch. Their numbers will at least jump this quarter. they always have a rise and then fall as a new device is launched.. its just the nature of it. android's is constantly on the rise because of the constant influx of new devices. people dont need to wait for yearly upgrade cycles like iOS users do. Android devices are a dime a dozen. Anyone can buy a brand new android device at a fraction of the new iPhone 4S, other things being equal. But don't tell that to the village idiot of phonearena since that will be beyond his comprehension. Nokia phones once dominated the landscape and look at Nokia now. Constant influx of dime a dozen devices doesn't bode well for android OEMs due to ROIC, which is related to gross margins. Down from 20.3 million to 17.1 million iPhones.. good job, apple. Keep it up. and I understand why sniggly says they will jump up again..but I'm not so sure anymore. if you just look a little past those 4 million initial weekend sales, things are looking very grimm for apple. I expect that ballon to blow it self out very soon and very fast..faster then last Harry Potter's or Transformers' box offices. If you get what I mean. They will be lucky if they go over 20 million iPhones by the end of this quarter imo. The 4 million bogey is just for the iPhone 4S. It speaks nothing about the iPhone 4. For that quarter, Apple sold 17.1 million iPhones, which is an improvement from 14.1 million, in the year- ago quarter, respectively. Therefore, Apple sold 3 million more iPhones on a YOY comparison despite rumors of an iPhone 5 and deferring carriers. Yes, stocks drop. That happens all the time. Really though- iPhone sales in trouble? The iPhone 4S will not sell as well as a iPhone 5 completely reimagined would, but it will happily blow past most devices out there, and the profit level on them will be so much higher due to the reuse of the existing body style. I do believe the pressure from high end Androids and either a stronger WP offerings from Samsung and HTC and really good Nokias and maybe even a resurgent RIM (okay, I made that one up.) will force Apple to really hit the next iPhone hard, but I do not doubt them for one minute. There will be no overall sales records for the iPhone 4S, but boy those single day sales were more than some devices yearly profits. That share is over $420 at market close and is enough to buy a number of brand new android devices. 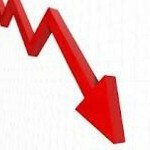 @ardent, iPhone sales FELL quarter on quarter THIS YEAR. 20.3 million in second quarter, and 17.1 million in the third. And that much of a fall NEVER happened since the iPhone exist. It is because iPhone4 was already having a hard time keeping up with superior android phone onslaught, and because of people were holding back for the successor. For the epic fail successor that the 4S is. Mark my words, the sales of 4S are going to experience a steep, steep decline very soon. And when you look at what android has to offer now, and during the next 3 quarters - three quarters that apple has to endure with this 4S - things are indeed looking very very grimm for apple. Alarming, in fact. If I were an apple shareholder, I'd sell mine right now. @darac, the compaison is YOY or commonly known as year-over-year and on that basis, sales are up 3 million. The reason for YOY is to avoid apples to orange comparison by avoid seasonality and other factors, etc. The sequential decline has to do with timing of the iPhone 4S launch. That means sales shifted one fiscal quarter due to said timing. If you noticed, 4 million 4S phones has being sold during the 3 day launch weekend.